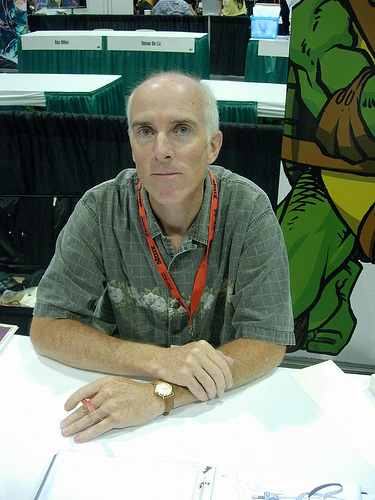 Michael Dooney is an American comic book artist and toy designer best known for his works on the Teenage Mutant Ninja Turtles series. Dooney also created the comic book series, Gizmo in 1986 under Mirage Studios. TMNT Volume 1 #4 (Second printing) “Rescuing Master Splinter) – Cover artist (art also used for first NES game). TMNT Volume 1 #5 (Second printing) “Teaming Up With Fugitoid” – Cover artist. TMNT Volume 1 #9 “The Passing” – Penciler and cover artist. Leonardo #1 “What Goes Around… Comes Around” – Inks and tones. TMNT Volume 1 #10 “Silent Partner” – Inks and tones. TMNT Volume 1 #13 “The People’s Choice” – Writer and artist. TMNT Volume 1 #27 “Dreams of Stone” – Writer and artist. TMNT Volume 1 #46/47 “Masks” – Writer and penciler. Gizmo and The Fugitoid – Co-writer and artist. Turtle Soup Volume 2 #1-4 “TMNT Attack!” – Writer, artist and cover artist. The Savage Dragon/TMNT #1 “Enter the Savage Dragon” – Writer and penciler. TMNT/The Savage Dragon #1 – Writer and artist. Archie TMNT Adventures Mini-series #1-3 “Heroes in a Half-shell!” – Penciler and writer (adapted story). TMNT Volume 4 – cover painter of all issues.